Horned humans have a rich background in myth. Also, from the horns of Alexander to the horns of Moses many important figures have been purported to possess horns. While in these cases the horns were a... matter of misinterpretation or illusion, many notable naturalists and medical scholars have recorded occurrences of genuine horned humans. While technically not horns, human beings have been known to sprout horn-like outgrowths and many of these outgrowths have been located on the head. The earliest reliable account can be found in the report of German surgeon Fabricius Hildanus. In the late 1500’s he encountered a man with horns protruding from his forehead. Several other cases have been well documented by noted naturalists and medical experts. In his book Anatomicae Institutiones Corporis Humani Dutch naturalist Bartholinus mentions a patient with a horn measuring 12 inches and in 1696 there was a well know case involving an old woman in France who had her amputated 12 inch horn presented to the King. There is also an account from around the same time regarding the extirpation of a horn nearly ten inches in length from the forehead of a woman of eighty-two. Finally, in 1886 the famous dermatologist Jean Baptiste Emile Vidal presented before the Academie de Medecine a twisted horn from the head of a woman. That horn was ten inches long. Several surgeons and naturalist recorded similar events and many went on to remove and actually collect the horns. There is one human horn 11 inches long and 2 1/2 in circumference currently in the collection of a London museum. All told, before 1900, there were over one hundred confirmed cases of horned human beings. A correlation between ages and gender became apparent with elderly female cases being more common. Surprisingly, the horns would often begin growing back after being removed, this occurred in the Vidal patent, and there is one case in which the condition seemed genetic, with both a father and son displaying the condition. Perhaps the most famous of all the horned marvels was Ripley’s ‘Human Unicorn’. In 1930, a Chinese farmer from Manchukuo was discovered by an expat Russian banker. The Russian was able to take a picture of the man and he sent the snapshot off to Robert Ripley of ‘Believe It Or Not!’ fame. 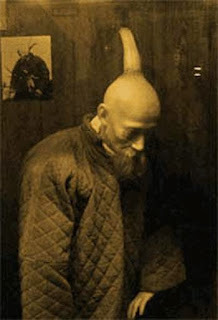 Known only as Wang, or sometimes referred to as Weng, the farmer was normal in every respect except fot the fact that he possessed a fourteen-inch spire-like horn growing from the back of his head. Ripley offered a huge cash reward to anyone who could produce Wang for an appearance in his Odditorium. However Wang disappeared from the public eye in the early 1930′s and was never heard from again. The causes for human horns are varied. Most often it is attributed to benign calvarial tumours, such as osteomas, and an aggressive variant of a condition known as cornu cutaneum. It is important to note that ‘horns’ can grow anywhere on the human body but that the condition manifesting on the head only is a rarity. Today, horned human beings are practically non existent. There have been very few cases in the last one hundred years with modern medicine likely diagnosing and eliminating the situation before it grows into a real problem. Still, the occasional case does crop up. image: photo of Wang exhibit in Ripley’s Museum.